Happy Monday! Since September is tomorrow I am torn. On one hand I can't wait for fall and sweaters and boots and cool weather. On the other hand I am so sad for summer to end. It seems like now that I'm an adult I look forward to summer only to have it end so quickly. I realized this weekend that I had not been back to my pool since July 4th! This past weekend I went to my pool and hung out and plan to do the same for Labor Day. I feel like this outfit reflects my feelings perfectly. The rust color screams fall but the pieces were still light enough to wear in the heat. 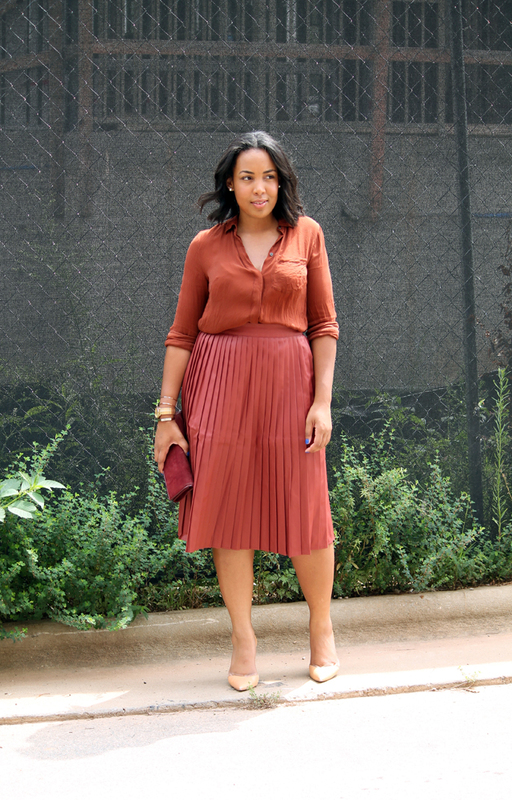 This pleated skirt is awesome. It's coated so it looks almost like leather. Are you ready for fall or wishing for an endless summer?